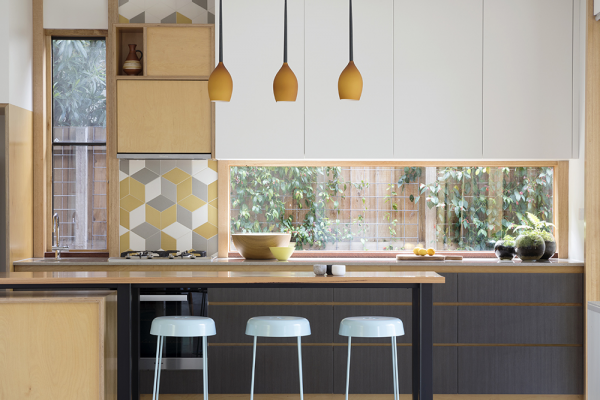 The Thornbury House is a low cost, compact family home set within a quiet, inner-suburban context. 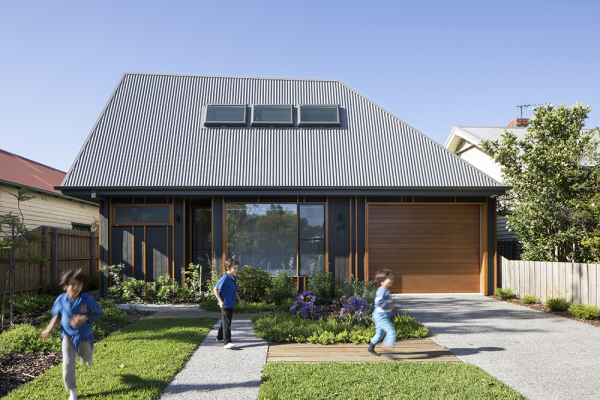 The design is underpinned by its playful roof form which references its surrounding context and is stretched and pulled to accommodate a double storey residence in what appears to be a single storey dwelling. The project is firmly embedded in the scale, materiality and form of its context both in its overall expression and detailing. The building references and reinterprets the roof forms and lightweight cladding of adjoining properties. The pitched roof form is immediately recognisable as a distorted version of neighbouring roofs. Where adjacent properties employ cover strips to conceal cladding joints, the Thornbury house utilises hardwood battens that conceal joints in the cladding and add texture to the façade. The result is a house that is simultaneously referential and divergent from the prevailing street character. Internally, the project draws on the courtyard typology which enhances the environmental performance of the house and ensures abundant light is delivered to all living spaces. The pitched roof volume which is generally utilised to accommodate upper level bedrooms is expressed internally over the living area offering a liberating shift in the scale of the space and a continuity between the internal and external expression of the house. 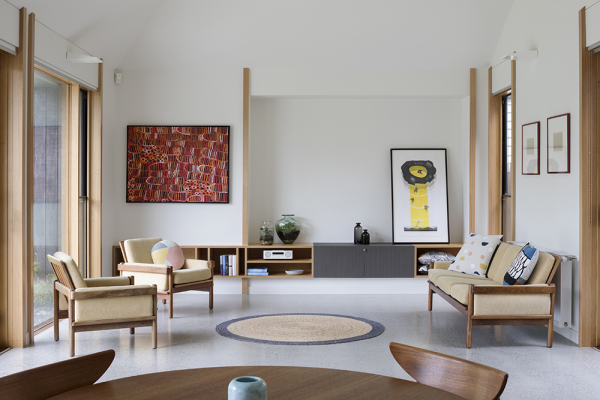 The Thornbury House was developed in close collaboration with the clients who had spent considerable time contemplating their aspirations for the project. The clients are a busy family juggling the demands of work, study and raising a young child. They are also avid gardeners who had clear visions for how the external spaces would be used. In addition to their explicit programmatic requirements, they were looking to build a home that would be easy to occupy and maintain, that was environmentally sustainable, and that offered abundant natural light and connections between indoor and outdoor spaces. 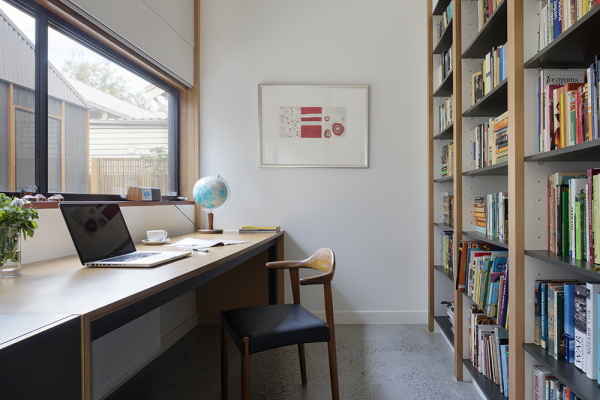 As the client is studying part time whilst raising a child, they needed a space that they could retreat to whist retaining a connection with the living spaces. 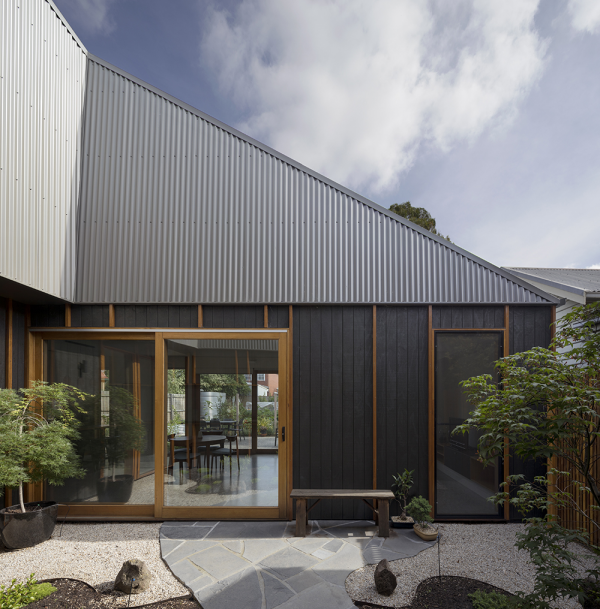 A courtyard was incorporated into the design to create a buffer between active and quiet spaces and allow northern light to penetrate deeper into the house. The study is physically separated from the living area but offers direct views to the living area through the courtyard, thereby facilitating passive observation of living area activity. Large sliding doors from the living area establish a fluid connection with the outdoor spaces which are generously proportioned owing to efficient planning of internal spaces. Generous storage and concealed messy areas such as the butler’s pantry make for a house that is easy to live in. The design addresses and exceeds both the programmatic and aspirational components of the clients brief in every way- they remarked “It fits us like a glove”. The housing industry is dominated by bulk built homes that generally offer minimal design value, and are poorly sited and constructed but have a price tag that is accessible to the wider community. At the other end of the spectrum is the high end residential market which is broadly characterised by carefully designed building forms, generous and crafted internal spaces and complex structures which are built at a cost that only the affluent can afford. 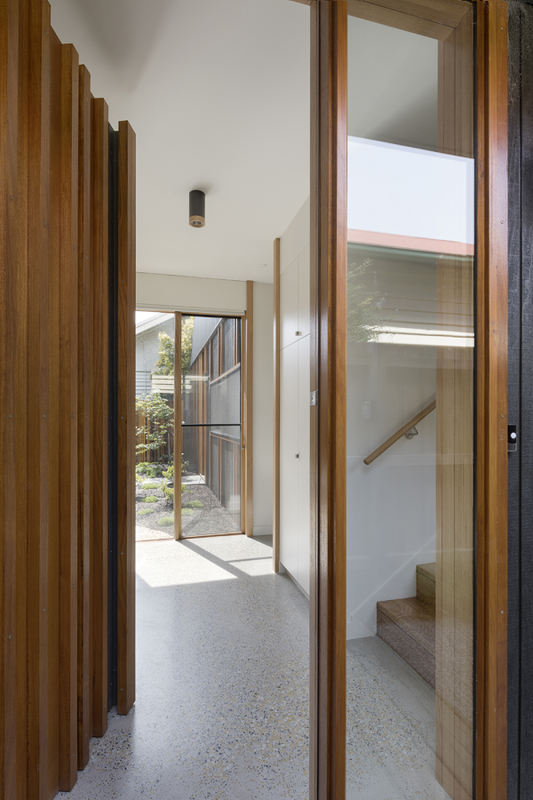 The Thornbury House sought to provide a highly considered architectural response to the clients brief for a budget that approached the bulk-built market. The overriding strategy to achieve this was to manipulate traditional construction techniques to create a building form that would be cheaper to build and that would be simultaneously familiar and surprising. 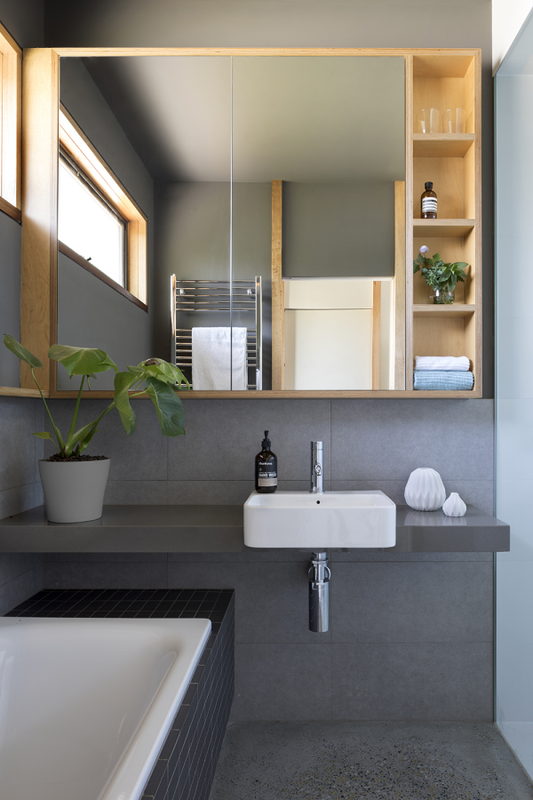 Through avoiding structural complexity and excessive detailing and through careful spatial planning to maximise natural light and passive ventilation, the project was able to deliver robust light filled spaces and a high level of workmanship on a lean budget. 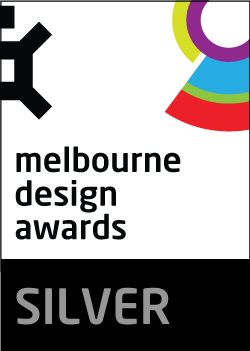 The clients approached us with a fairly common predicament- they valued good design and architecture, but had a budget that was heavily constrained. The functional brief was considerable- 3 bedrooms; 2 bathrooms; a study; an open plan kitchen/ dining/ living area with a concealed butler’s pantry; a laundry; and a lock-up garage with workshop facilities. The challenge was to address both the aspirational and functional components of the client’s briefs on a tight budget. In response, we developed a proposal that prioritised buildability, efficient planning, and a restrained material palette whilst ensuring that all living spaces and primary bedrooms had access to northern light and natural ventilation. The building is clad internally and externally in cost effective materials which are enhanced by the manipulation of standard details such as full height hardwood battens in place of architraves, thereby affording the project a warmth of palette and a textural richness that elevates it above the standard construction methods referenced. The house is planned efficiently, reducing building costs by minimising the building footprint without compromising the quality of internal spaces. 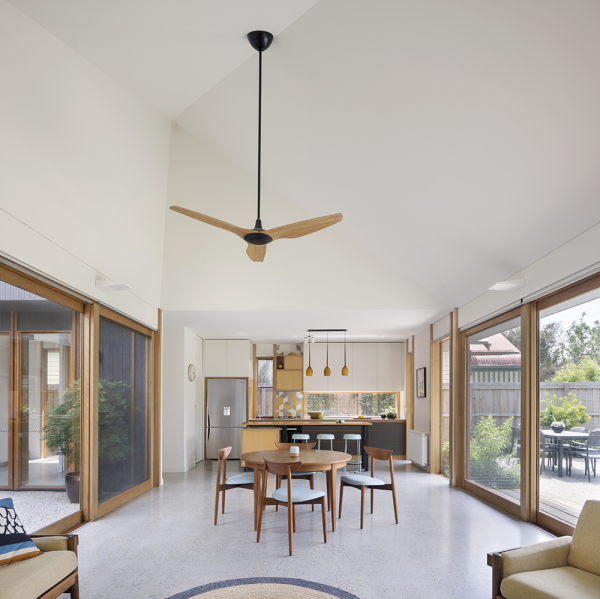 The living area is straddled by both the courtyard and rear yard, creating continuous physical and visual links between internal and external spaces, thereby generating an expansive feel in all living spaces despite the modest size of the rooms. 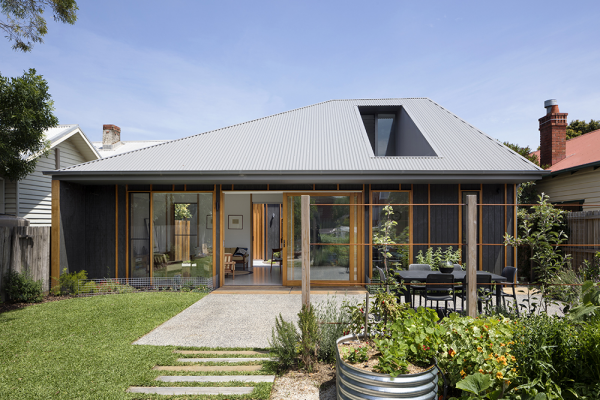 The design of the Thornbury House is underpinned by principals of Solar Passive design. All living spaces are orientated to take full advantage of the site’s northerly aspect. 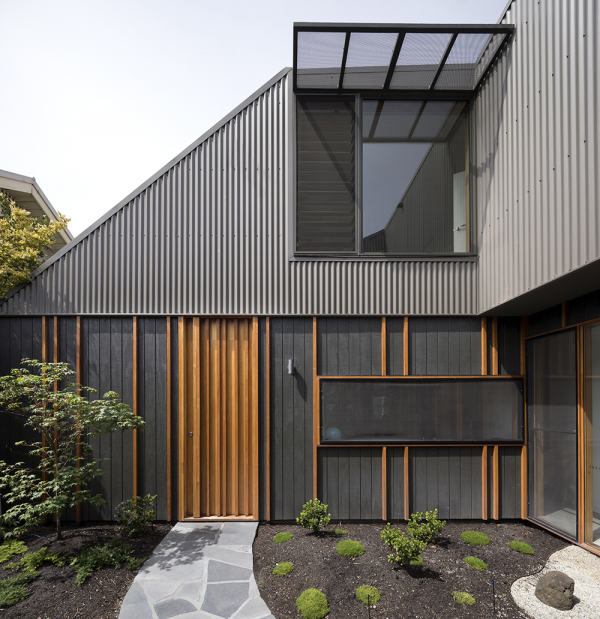 The courtyard facilitates natural cross-ventilation through the living areas and master bedroom and ensures that sunlight penetrates deep into the house’s peripheral and circulation spaces. Ceiling fans have been installed in all rooms as an alternative to energy intensive air-conditioning units. All windows are double glazed with timber frames that offer optimal energy performance. Eaves have been carefully located to protect North-facing rooms from solar heat gain in the summer whilst facilitating solar access in the winter. The polished concrete floor also acts as a heat sink to capture and release solar heat during colder months. All of these design considerations culminate to create a building that is exceptionally energy efficient in its ongoing use.